Pizza deemed a vegetable. Nuns growing marijuana. Vowing to live life according to the cycles of the moon, the aforementioned sound like the stellar makings of a pretty entertaining but implausible dream. However, just as Congress once declared pizza a vegetable, the “nuns” behind Sisters of the Valley really are growing and selling their very own cannabis. Christine Meeusen, now known as Sister Kate, originally declared herself a nun after unearthing a great passion for activism. From protesting local park closures to fighting for her rights during the 2011 Occupy movement, Sister Kate had a taste for change and wouldn’t stop until her voice was heard. Sister Kate, who eventually earned herself the nickname “Sister Occupy” during her time as a “anarchist activist nun,” would soon move from the picket lines to the cannabis farms of Merced County. Her mission was to combine her even greater love of all things cannabis with her desire to create jobs and a supportive sisterhood. In January 2015, Sister Kate officially launched Sisters of the Valley, which still sits tucked away on the same quaint farm in the San Joaquin Valley. By the end of the farm’s first year, word had spread and Sister Kate was approached by a second sister seeking to spread health and healing through cannabis as well. Today, there are a total of 13 sisters who operate out of their Merced farm location. While these nuns may wear the same garb as traditional nuns, these Sisters praise a much higher power, vowing to respect the “breadth and depth of the gifts of Mother Earth,” while striving tirelessly to “bridge the gap between her and her suffering people.” From taking a vow of chastity to a vow of ecology, the Sisters of the Valley practice great spirituality through a combination of Native American-inspired and ancient Northern European “wisdom” practices. 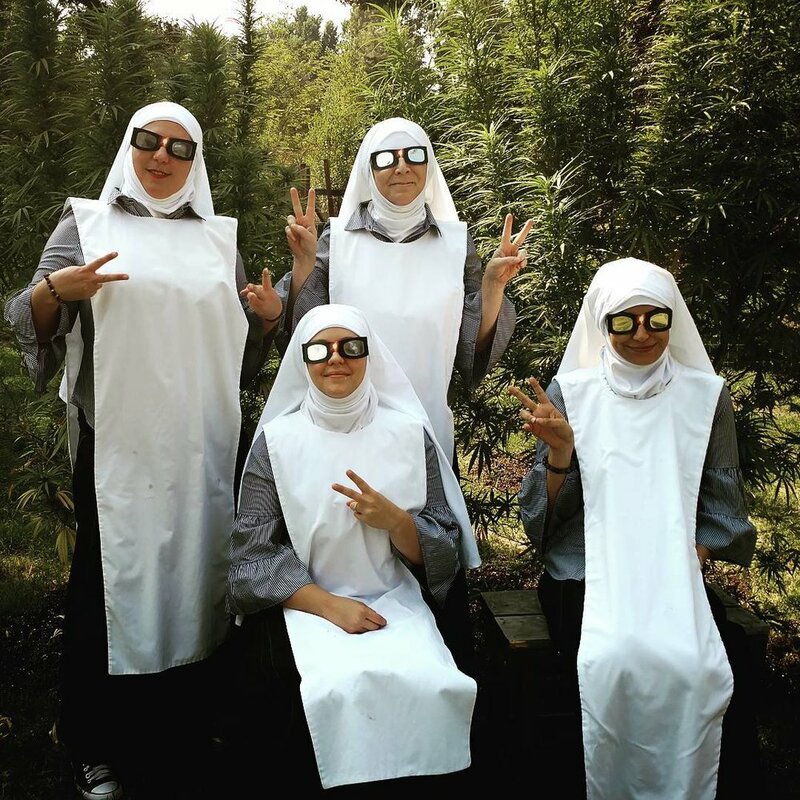 Sister Kate and her “weed nuns,” as she calls them, prepare all of their non-psychoactive cannabis products (more commonly known as CBD) during moon cycles, inspired by the ancient wisdom of Northern European and Native American spiritual practices. These women are “activists on a mission to empower people to heal themselves” in this journey we call life. “Our vows are about organizing our life by moon cycle. So we take a vow of obedience to organize [our] lives by moon cycle and the quarters of the year to keep in touch with [our] ancestral mothers,” Sister Kate says. While the mission for the Sisters of the Valley seem filled with a strong, positive desire to help heal those in need, the path to get to where they are today has been littered with obstacles that they continue to face today. Amid the hostility from local law enforcement and the aggressive banking system, Sister Kate and company try not to hold grudges, keeping open minds and giving hearts to all feeling a call to spread the healing benefits of cannabis. For more information visit https://www.sistersofcbd.com/.